Engaged couples, one of whom is a registered member of St. Joseph’s church, should notify the pastor of their marriage intentions a year in advance of the proposed wedding date. In order to be married in a Catholic Church both persons should be legally free to do so (i.e. of legal age, not currently married, etc.). Someone previously married, in addition to a civil decree of divorce, may require a church annulment (see Annulment link on the side bar). It is possible to have a Catholic Church wedding for a couple, one of whom is not Catholic. a copy of the baptismal certificate for anyone who is a baptized Christian (Catholic, Orthodox or Protestant). Such certificates are also available at the church where one was baptized. The engaged couple needs to meet with the pastor once to arrange the registration, and again at a later date to finalize the details relating to the wedding service. A rehearsal with all involved should be planned at the church a day or two before the wedding. Please clarify if you wish the priest to attend the wedding banquet afterwards. In order to spiritually prepare for married life it is most appropriate (although not essential) to make a good confession before the marriage ceremony. Once an engaged couple has been formally registered to be married at the church the planning process should be discussed and finalized. Date – a wedding is typically held on a Saturday, however other days could be considered (i.e. Monday of a holiday weekend). The only season during which a wedding may not take place is Lent (the 6 weeks preceding Easter). Church – as St. Joseph’s is currently located in a small building, wedding services could be held at another Ukr. Catholic Church. The couple would need to negotiate this option with the pastor of the other church. 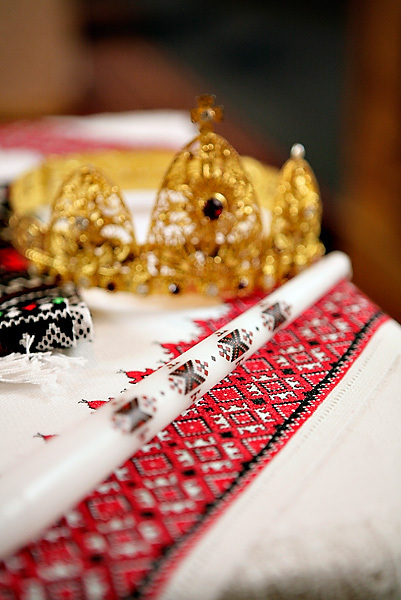 Ceremony – the Ukrainian wedding service is called the “Crowning Service”. (This is not a Eucharistic liturgy as in the Roman Catholic church.) While the format has standard elements, some of them can be modified to accommodate the non-Ukrainian party. The service is a sung ritual and requires the participation of vocalists (choir or cantor). Marriage is one of the Sacraments of the Catholic Church in which a man and woman are united and blessed by God. Their union is blessed by our Lord Jesus Christ through the Church. God's grace is imparted to them to live together in His love, mutually fulfilling and perfecting each other. 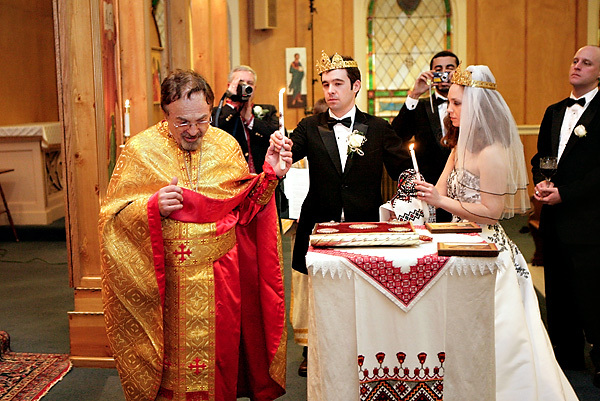 The Mystery of marriage of the Ukrainian Church is steeped in ritual and symbolism. Each of the rituals has special meaning and significance. Rings -The rings are blessed by the priest who takes them in his hand and, making the sign of the cross over the heads of bride and groom, says: "The servant of God ... is betrothed to the handmaid of God ... in the name of the Father, of the Son, and of the Holy Spirit." 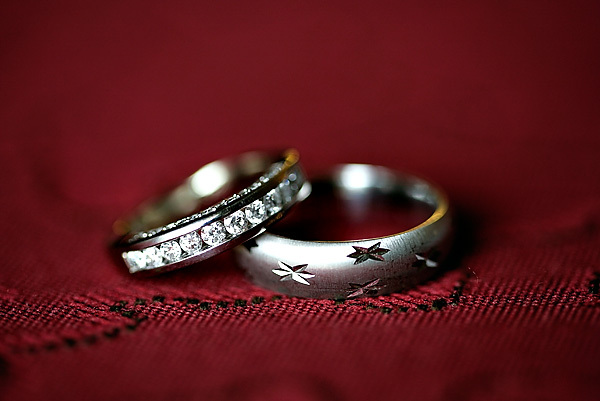 The rings, of course, are the symbol of betrothal and their exchange signifies that in married life the weaknesses of the one partner will be compensated for by the strength of the other, the imperfections of one by the perfections of the other. By themselves, the newly-betrothed are incomplete: together they are made perfect. Thus the exchange of rings gives expression to the fact that the spouses in marriage will constantly complement each other. Embroidered Towels – The symbolism of embroidery has been passed down from generation to generation. The embroidered towel, interlaced with threads of various colours, represents all aspects of human life: family, love, tradition, hardship and faith in God. The couple may stand on one of the towels to indicate the new life they now begin. Another towel is used to tie their hands together during the ceremonial walk, emphasizing the unity they now share in their common journey. 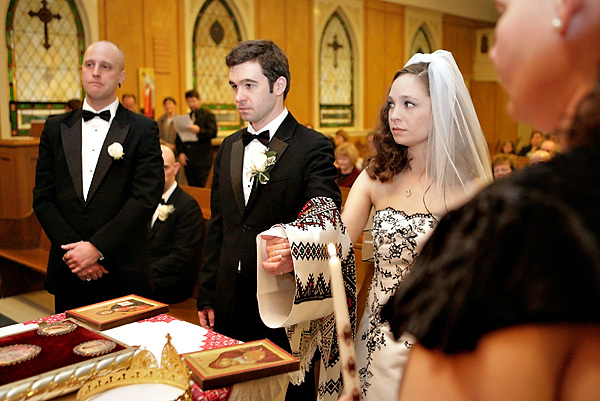 Candles – The bride and groom are handed candles which they hold during the service. The candles are like the lamps of the five wise maidens of the Bible, who because they had enough oil in them, were able to receive the Bridegroom, Christ, when He came in the darkness of the night. The candles symbolize the spiritual willingness of the couple to receive Christ, Who will bless them through this Mystery. Crowns – Most often in the form of a periwinkle wreath, placed on the heads during the crowning ritual. They are a symbol of love, purity and fertility. They are placed on the heads of the bride and groom to signify the dawn of a new kingdom to be ruled by the couple—side by side. They also remind the newlyweds that their marriage is a partnership in Christ, and that they owe it to God and to each other to live a life of honor and love. 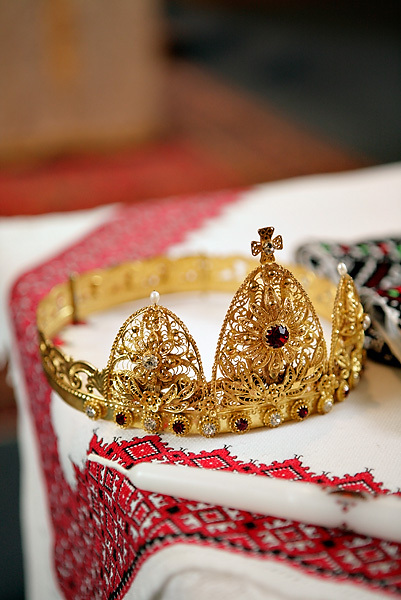 The Common Cup – The service of crowning is followed by the reading of the Epistle and the Gospel. The Gospel reading describes the marriage at Cana of Galilee which was attended and blessed by our Lord and Savior Christ, and for which He reserved His first miracle. There He converted the water into better wine and give of it to the newlyweds. In remembrance of this blessing, wine is given the couple. This is the "common cup" of better life denoting the mutual sharing of joy and sorrow, the token of a life of harmony. 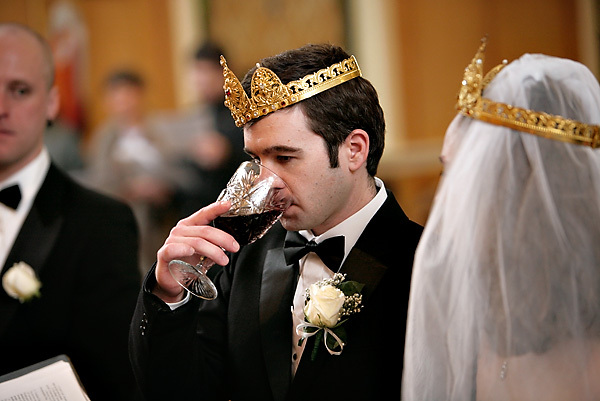 The drinking of wine from the common cup serves to impress upon the couple that from that moment on they will share everything in life, joys as well as sorrows, and that they are to "bear one another's burdens." Their joys will be doubled and their sorrows halved because they will be shared. Ceremonial Walk – The priest then leads the bride and groom in a circle around the table on which are placed the Gospel and the Cross, the one containing the Word of God, the other being the symbol of our redemption by our Savior Jesus Christ. The husband and wife take their first steps as a married couple, and the Church, in the person of the priest, leads them in the way they must walk. The way is symbolized by the circle at the center of which is the Gospel and the Cross of our Lord. During this walk around the table a hymn its sung to the Holy Martyrs reminding the newly married couple of the sacrificial love they are to have for each other in marriage - a love that seeks not its own but is willing to sacrifice for the other. The Blessings - The couple return to their places and the priest, blessing the groom, says, "Be thou magnified, O bridegroom, as Abraham, and blessed as Isaac, and increased as Jacob, walking in peace and working in righteousness the commandments of God." And blessing the bride he says, "And thou, O bride, be thou magnified as Sarah, and glad as Rebecca, and do thou increase like unto Rachel, rejoicing in thine own husband, fulfilling the conditions of the law; for so it is well pleasing unto God." 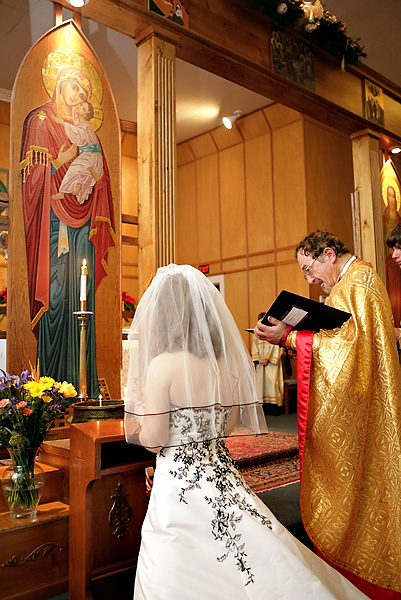 Toward the end of the ceremony, the priest escorts the bride to the icon of the Blessed Virgin Mary. As the priest offers up prayers on her behalf, the bride kneels in front of the Virgin Mary and presents her with a bouquet of flowers. There is no standard fee for liturgical services (typically honoraria for the priest range from $200 to $300). Fees for the use of another church need to be arranged with the other pastor (typically $150 - $200). Fees for a choir or cantor also need to be arranged with those parties.